Today I discovered that it is true: homemade pita bread is very easy to make and is sooo much better than store-bought pita! I had finished bread and I had some free time so I decided to make something I had never made before. I immediately thought of all those times that I ran into the pita bread recipe in other blogs or websites. Everybody makes the same comment about how they will never ever go back to buy pita breads after having tried to make them at home. Such a strong and shared statement couldn't leave a bread-lover like me indifferent. As I said, my result confirmed other bloggers' opinion: yummy! super duper yummy! Good-bye store pita bread. Sift the flour and salt together into a bowl. In a small bowl, mix the yeast with the water until dissolved, then stir in the olive oil and pour into a large bowl. Gradually beat the flour into the yeast nixture, then knead the mixture to make a soft dough. Turn out onto a lightly floured surface and knead for 5 minutes until smooth and elastic. Place in a large clean bowl, cover with lightly oiled plastic wrap and let rise, in a warm place, for about 1 hour or until doubled in bulk. Punch down the dough. On a lightly floured surface, divide it into 6 equal pieces and shape into balls. Cover with oiled plastic wrap; let rest for 5 minutes. Roll out each ball of dough in turn to an oval about 1/4-inch thick and 6 inches long. Place on a floured dish towel and cover with lightly oiled plastic wrap. Let rise at room temperature for 20-30 minutes. Meanwhile, preheat the oven to 450F. Place 2 or 3 baking sheets in the oven to heat at the same time. 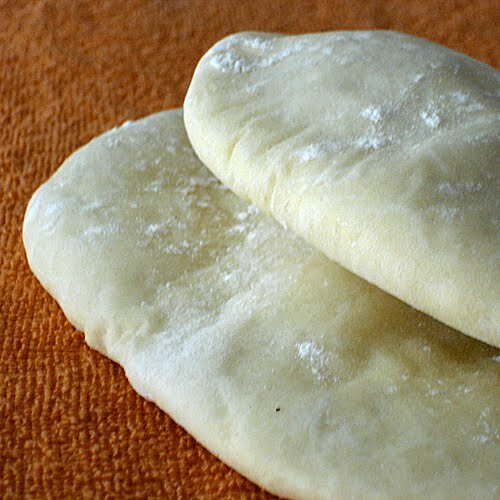 Place two or three pita breads on each baking sheet and bake for 6-10 minutes or until puffed up; they do not need to brown. It is very important that the oven has reached the recommended temperature before the pita breads are baked. This is what ensures that they will puff up. Transfer the pitas to a wire rack to cool until warm, then cover with a dish towel to keep them soft. To make whole-wheat pita breads, replace half the white flour with whole-wheat flour. You can also make smaller round pita breads about 4 inches in diameter. Check out many other bread-related goodies on YeastSpotting! I completely agree with you. I admire homemade pitas! They are absoltely better than the ones at stores. It smells so tempting and I love to spread a little butter on a newly baked pita. I sometimes make it for sunday breakfasts. My husband and i go through pitta bread like it is running out. I have always wanted to make my own but have never found a recipe that works well. I am going to make this and hope for the best. It looks great here. Fingers crossed. Joudie: I never dared making pita before this time....somehow I thought it was complicated...the result was so good that I barely had the time to take a decent picture that they were all gone! I saw your pita picture in Yeast Spotting this morning and would very much like to make it. I tried printing it out but was unsuccessful. Is there some secret to printing from your blog? I'll appreciate hearing from you. Hi again anonymous, I did put a print link...at the top of the page under the search. I tried it and it seems to work fine. Let me know!